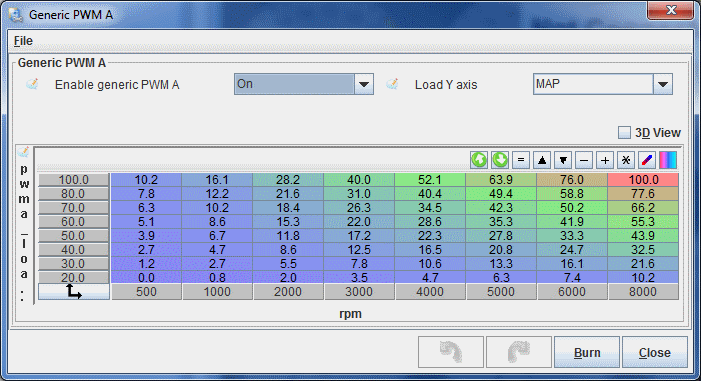 To translate that into a PWM frequency, you can use this Excel spreadsheet: http://jbperf.com/io_extender/PWM_freq.xls. This allows PWM frequency of up to 93750 Hz. The values in the table are the duty cycle % but there are represented internally as a 0-255 value. That is why there is a decimal value. However, the precision is about 0.4% (100/256) which means the value you enter will be rounded to the closest valid value. The RPM and load are read over CAN from the MS2 or MS3 about 20 times per second. 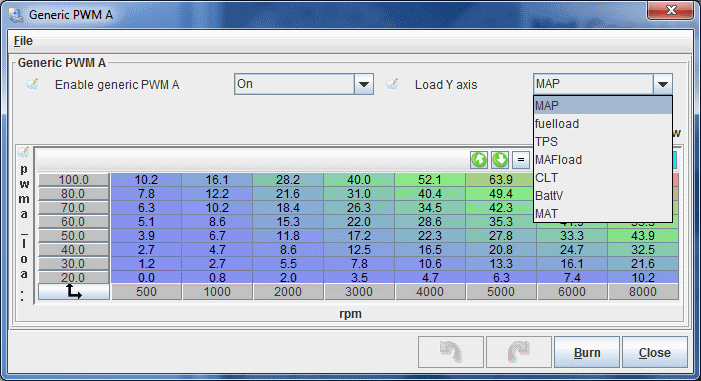 Since the RPM and the load parameters are located in the internal table in a standard way on both MS2/Extra and MS3, the firmware can read the values without any user input (other than specifying which parameters to use). EDIT: Firmware version has been changed to fix a table interpolation bug. What would it take to be able to use this as a progressive nitrous controller. %/time Im currently running zex noids. looking forward to using the tinyiox board. dbmsrcr1 wrote: What would it take to be able to use this as a progressive nitrous controller. %/time Im currently running zex noids. looking forward to using the tinyiox board. One solution would be to use a solid state relay. But you would also need a driver circuit because you wouldn't want to driver the SSR directly from the TinyIOx CPU. So you could probably use a PN2222A with a base resistor to drive the SSR. There was a bug with the table interpolation routine. A bug fix version has been released: http://forum.jbperf.com/viewtopic.php?f ... 6078#p6078. Anyone using the generic PWM function must upgrade their firmware version otherwise unexpected results can occur. I have also changed the link in the post above. The load axis will likely have something similar to the MS3 alpha code in a future release (need to wait for a TS update). 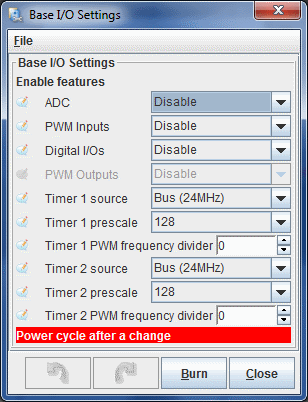 However, it is unlikely to have more than 2 PWM outputs in the near future. So i need an IOX-OEM? with that is possible to have the y axis free like ms3 alpha? It is still not implemented for the IOx-OEM either because that feature requires some changes to TunerStudio. The TunerStudio changes are coming soon and then it will be added to the IOx and TinyIOx code. So i followed these steps and got the fan operating as required. Thanks Jean! Good to see some positive results! Which PWM frequency did you use?